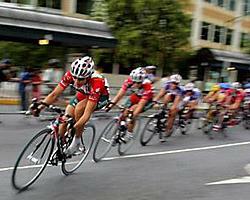 Racing a bicycle is thrilling and challenging, though I find that the process of training and racing can grow to resemble the rushed regimen of a work day in a big city. As a native New Yorker, I'm all too familiar with the daily sequence of events that form a cycle and seem to dominate life. The French have an expression, "m�tro, boulot, dodo," which means "commute, work, sleep." That's exactly what life begins to feel like as each day is comprised of the exact same components, in the exact same order. Training, stretching, recovery, vitamins, massage, bike prep, number pick-up, warm-up, more stretching, racing, recovery drinks�and soon life begins to feel like "v�lo, boulot, dodo." Needless to say, it gets tiresome after a while. Fortunately, I had plans to spend some time this July in the French Alps, in a small town at the foot of Alpe d'Huez. What better place to mend my relationship with my bicycle and break free from this unromantic routine we had established? While browsing on the website of the town's bike shop, Cycles et Sports (where I ended up going for all my cycling related needs), I noticed a link for a "cyclosportive race" that would take place on the last day of my stay in the village of Bourg d'Oisans. Called "La Marmotte," named after the adorable yet elusive animals that dwell in the surrounding mountains. I say "elusive" because I tried very hard to spot one, and besides the one lying on the side of the road on the way up the Col de la Croix de Fer, I couldn't find any. Apparently, I don't have "the eye" for the marmot, as my hotel proprietor explained to me. It sounded spectacular, with 174km and more than 5000 meters of climbing over the Col du Glandon, the Col du T�l�graphe, the Col du Galibier, and finishing at the top of Alpe d'Huez. After doing the math and figuring out that it would be more than 105 miles and more than 15,000 feet of climbing, I signed up! Since the event was scheduled for the last day of my visit, I had the pleasure of observing the steady influx of approximately 6,000 clean shaven participants (of which less than 200 were women!) into a town that already welcomes cyclists warmly. In the meantime, I took advantage of being in an extraordinarily beautiful area and rode the nearby passes, with the daily recommendations of Christian, the proprietor at Hotel Oberland, where I was staying. He didn't just know the roads; he knew the gravel on the roads, the grade of every climb, and the weather on every pass. His love of cycling and genuine interest and concern for the quality of my daily excursions enhanced my already magnificent experience of the French Alps. Where else in the world does your hotel proprietor tell you he'll come get you in his car if there's any trouble on a ride? As more people arrived in the final days before the event, the town began to resonate with an excitement that was different from the kind I had felt at other more conventional bike races. It was an excitement that resonated with a pure love of cycling. This incredible ambiance set the stage for one of the most unforgettable experiences of my life. The day of "La Marmotte," the town of Bourg d'Oisans was literally filled to capacity with elite racers, competitive and recreational riders alike, all seeking to test their limits on the legendary mountain passes of the Tour de France. Climbing the Col du Glandon and seeing thousand of riders disappear into the switchbacks like an impressionist painting. Heading up the Col du T�l�graphe, looking over my shoulder and seeing the most splendid scenery imaginable. Climbing the Col du Galibier and having strangers from an assortment of non-English speaking countries cheer for me, reading my team name on my clothing, and struggling with the pronunciation of "Boston Scientific." Descending the Galibier via the Col du Lautaret and blasting through dimly lit tunnels. Climbing Alpe d'Huez after 160km in the mountains and watching the expressions of the people around me - knowing that I too, wore this unique look that was a blend of pain, exhaustion, and supreme pleasure. At the summit, I had to wait on line to find out what my final time was, and which certificate I would obtain. Within each category, riders would receive gold, silver or bronze certificates, depending on their finishing times. Some were there to win and some sought gold certificates, while others simply wanted to complete the event. As I watched the people ahead of me, I noticed that each one was gleaming with pride and happiness at having accomplished the feat, regardless of the type of certificate they held as they left. That pure, sincere love of cycling just hovered in the air above the thousands of finishers. Then, with my certificate in my jersey pocket, I descended Alpe d'Huez, returned to my hotel, attended to my bike, showered, stretched, took my vitamins, drank my recovery drink, ate my dinner and went to sleep�.with a smile.